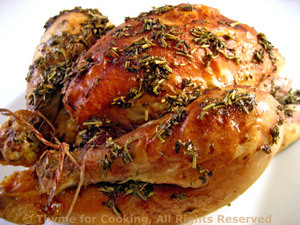 Roast Cornish Hens, Thyme for Cooking easy gourmet dinners. The hens and the gratin bake at the same time making this an easy, no-fuss dinner. 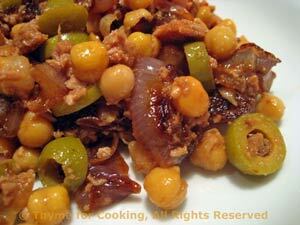 Caramelized shallots, olives and tuna add sweet and savory notes to chickpeas. A bit of Balsamic Vinegar and good olive oil to finish, and you have a 'winter salad' - good all year. Peel and thickly slice shallots. Heat 2 tsp oil in a small skillet. Add shallots and sauté until browned and starting to get crispy, about 15 minutes. Open, drain and rinse chickpeas; refrigerate unused portion. In a medium bowl mix chickpeas, tuna and olives. Add shallots and stir to combine. In a small bowl mix soy sauce, vinegar and oil. Pour over chickpeas and stir to combine. Serve. Small, perfectly roasted hens make an elegant presentation and are perfect individual servings (with maybe a snack leftover). If yours are larger birds, one may be enough, (you can split it in half before roasting) or fix two and have cold chicken/game hen for lunch tomorrow! Remember to put bowls for bones on the table - and wet towels for fingers. Wash hens and pat dry with paper towels. Mix 1 tbs oil with lemon juice and 1 tsp each of the herbs. Divide herb mixture and put half into each of the hens. Tie legs close and bend wings around and under the back - so it looks like they are lying there with their arms akimbo. It keeps them from flapping and gives the hen something to rest on. Lay them on a rack in a shallow baking pan. Mix the remaining oil, herbs, mustard and red wine and brush on hens. Put into 400F (200C). Bake for 50 - 60 minutes, basting every 15 minutes with wine mixture, until done. See techniques. I recommend a meat thermometer. Sunchokes, or Jerusalem artichokes, are the knobby, tan or purplish vegetable that you start seeing in late winter. They have a mild taste, making them very versatile. Peel them with a vegetable peeler. They turn gray quickly, so keep in water if not using immediately. Slice potatoes as thinly as possible with a sharp knife. Peel and slice sunchokes the same size. Lightly butter or oil a baking dish large enough to hold the vegetables. Layer a third of the potatoes, topped with half of the sunchokes. Pour a third of the milk over the top and sprinkle with half the shredded cheese. Finish with a final layer of potatoes. Pour the remaining milk over the top, sprinkle with nutmeg and finish with the Parmesan. Cover with a lid or foil and bake (400F, 200C) for 60 minutes. Uncover for the last 10 minutes of baking time. 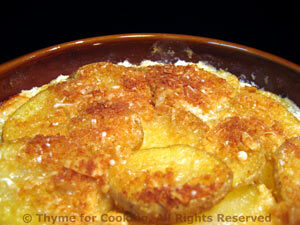 Note: Whenever I am baking potatoes with a liquid: gratin, scalloped, Savoyard, etc. I always put the baking dish/dishes on a baking sheet covered in foil. They almost always bubble over and this saves on oven clean up. Just wrap up the mess and toss.